Allison Winters loves the night. Games that harken back to the 8 and 16-bit eras are hardly something new and most games that do so are rather shameless about doing so. Quite a few however fail to capture the essence of the time instead just slapping some pixels together with some poor humor and calling it a day. However there are games like Shovel Knight that managed to carve out their own place by having originality and personality. While Octahedron is in no way a pixel art game, it still manages to capture the essence of those games of yore with a more modern flair. Octahedron has a rather simple premise: you’re at the bottom of an area and you need to make your way to the pulsating diamond in the sky (finding Lucy is optional). However in lieu of having a double jump to navigate the perilous obstacles you create temporary platforms at your feet to aid in the climb. It’s a central mechanic that is expanded upon in neat ways, such as launching your platforms or riding them along a pipe. Why players are doing any of this is minimally explained in the opening cutscene, and that’s fine—many games don’t need an epic story to be enjoyable. Just throw the player in and let them have some fun with the gameplay. Octahedron is equally tight lipped about what is going on mechanic-wise: the game instead teaches through design. With every new obstacle, the player is given a safe space to figure out what to do before being asked to apply the theory in a more dangerous situation. Every level introduces some new facet of your ability or a new type of platform for you to create, and lets you figure it out. The difficulty curve feels natural and I never felt like I was hitting a brick wall in terms of a mechanic or obstacle. As I learned each new thing the game threw at me felt joy at getting to overcome it. Each level felt fresh and fun without overwhelming the player with needed mastery of the mechanics. It’s like watching a tree that grows and blooms, and you’re just along for the ride. As said above, the game ditches what many throwback games love: pixel graphics. That is not to say pixel graphics are the easy way out, but it’s a tad overplayed at this point. 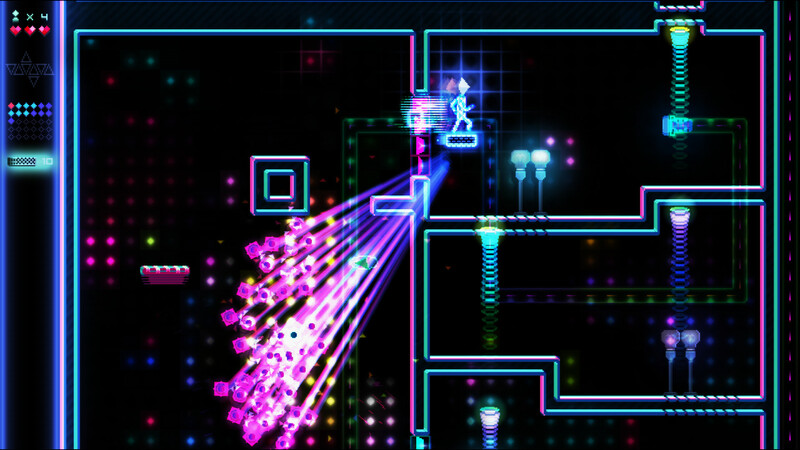 Instead, it opts for a neon look with simplistic shapes and an electronic soundtrack that lulls you into a trance. Giving the feeling of being at the world’s oddest nightclub with the colorful platforms contrasting the subdued backgrounds. The backgrounds allow the character and the obstacles he faces to pop out and add another layer to the games visuals. While everything about the game seems simple, it’s a front for the depths the game reaches in its mechanics and beautiful visual style. 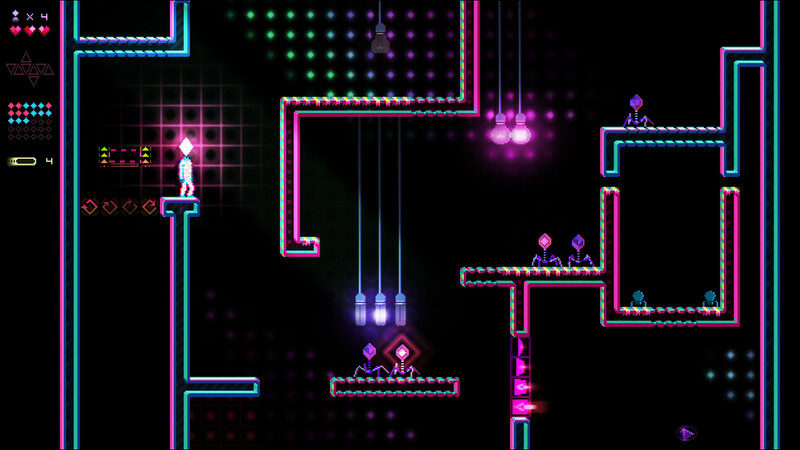 Octahedron is an experience that may not be unique but is so well executed that I can hardly fault it. The pulsing soundtrack and muted colors drew me in while the simple fun of platforming kept me hooked. It captures what made those games of yore so great while being able to stand on its own as an experience. If you have any love for old school platformers or just games with interesting mechanics then please pick this up immediately… pretty please.